WHAT IS OMEGA 3?- Fish oils are the basis of many people's supplement regimen, and for good reason. 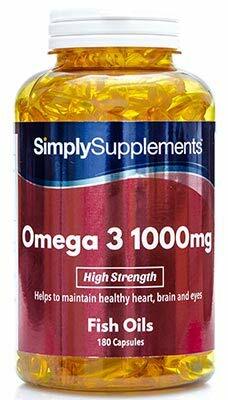 They provide omega 3 polyunsaturated fatty acids which are essential for general health and wellbeing. These 'good' fats are used for almost every bodily function and need to be consumed through the diet. UK MADE AND QUALITY ASSURED- We source certified fish oils from the deep cold waters of the Southern Pacific Ocean, off the coast of South America, which are considered to be some of the cleanest waters in the world and are subject to stringent environmental measures that protect the surrounding eco-system. MANUFACTURED IN THE UK- Goods Manufacturing Practice (GMP) approved for complete quality assurance of the highest standard of manufacturing. WHY CHOOSE SIMPLY SUPPLEMENTS?- Established over a decade ago, we have grown to become an industry leader supplying customers all around the world with premium quality supplements. Our purpose is simple. We are here to provide customers good quality products and value for money as well as genuine customer care, making healthy living simpler!